Today’s Photo of the Day is courtesy of this Johnson Farms cherry shaker sitting on the cooling pad just north of Mapleton. While this marvel of farming technology was resting at the time I took the photo a couple days ago, I heard a rumor that it might be in the orchard today, happily achieving its life mission – shaking cherries. As mentioned here, most Old Mission Peninsula farmers have either started or will start shaking sweet cherries this week. That means you’ll find them on OMP roadside stands, with tart cherries to follow sometime next week. 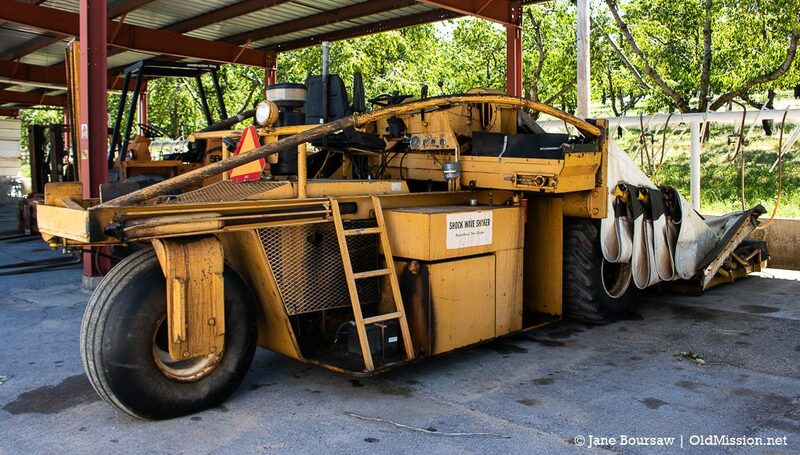 It also means we need to be extra careful while driving the OMP roads for the next few weeks, and watch for trucks and tractors turning into and out of orchards and cooling pads. And while it may be tempting to sample a few cherries from the orchards along the roads, those little red and golden cherries are the farmers’ livelihood, so a better route is to stop by one of the many OMP farmstands along the roads and buy a quart or two or three. And if you’re wondering how this machine works, click here to find out. Happy Cherries! And a safe and productive cherry season for all the farmers!